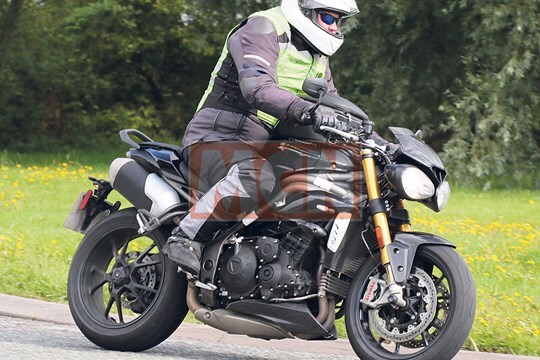 The best pictures yet of Triumph’s 2016 Speed Triple have emerged of the bike undergoing final tests in the UK. The latest shots confirm the Speed Triple updates that have previously been revealed in MCN over recent months, including all-new bodywork, reshaped headlights and tweaks to the brakes, with the Showa-sprung base model gaining the current ‘R’ version’s Brembo calipers. The 1050cc engine is also tweaked, with new covers, a redesigned exhaust to help meet Euro4 rules and extensive electronics updates including traction control. Our latest shots show the high-end R model, complete with Öhlins suspension, in completely finished form. Several of the bikes are believed to be on the road in the UK at the moment, piling on the miles to iron out any last-minute niggles before the official unveil, likely to be in the next month or so.